It's a Pokedex, all right. The Pokedex book for Pokemon X and Pokemon Y book is a hard-back book full of Pokemon knowledge. Need to know the height of a Helioptile? It's in there! Need to know what level Lucario learns Aura Sphere? It's in there as well! The Pokedex is a device used to record information on Pokemon after they've been caught. 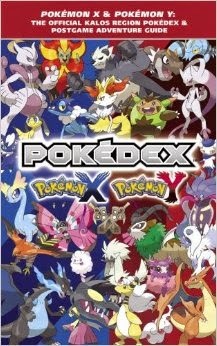 The Pokedex can also be used for reference, like in this book where you can look up any of the Kalos native Pokemon and their Mega Evolution forms. The book lists every detail about every native Pokemon- what type it is, it's stats, moves it can learn at what level, and so on. This book is more than a Pokedex though- it's also a breeding guide, a post-game adventure guide, a map, and a encyclopedia for moves, abilities, and items, such as Mega Stones and PP/HP Up. Let this book be your guide on your post-game journey. It's sold at Barnes and Noble for $20 in the US. I would recommend it to anyone who wants tips to breed perfect Pokemon, complete their Pokedex, and become the very best like no one ever was. or, the most decent person without cheats..